This doesn’t mean one egg or some fibrous whole grains. Eat some good protein. More is usually better. Protein in the morning will help set the stage for good appetite and hunger control the rest of the day and give your body plenty of nutrient dense food to start the day. Skipping or skimping on protein in the morning will usually lead to much more food thoughts and cravings down the line, unless your sleep, stress and hormones are all in check, which is not the case for most of us. Aim for at least 20 grams of protein but if you can get more it will help keep you full longer and suppress hunger much better. Some traditional breakfast foods will give you a nice chunk of protein but don’t think “breakfast foods” think food in general. Leftovers are great for breakfast. If you cooked up something tasty for dinner the night before, save a little for the next am. One of my go to breakfasts is a couple eggs and a hamburger patty. It’s tasty, nutritious and a big whack of protein (approximately 40 grams) and fat that will keep me full for hours. Imagination is the only limitation when it comes to breakfast protein. 4 eggs = 20 grams protein. 2 slices of bacon = 6 grams. 4 oz. 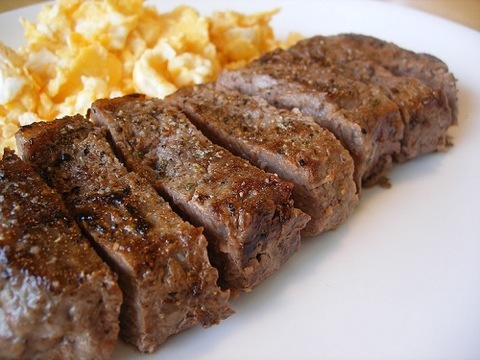 steak = 20-25 grams. 4 oz. chicken = 25 grams. 1/4 lb. hamburger = 20-25 grams. Greek Yogurt = 10-15 grams. If you run out of ideas… A scoop of good quality protein powder: 20 grams. Bottom line- get your protein in and see if it doesn’t set the stage for your day, controlling your appetite, energy, and mood. If you want more detail on this concept and the underlying physiology, check out this great post on Leptin from Health Ambition. Thanks for reading, have a great protein filled week!